The exhibition will be presented in the Elizabeth A. Sackler Center for Feminist Art, at The Brooklyn Museum, which is also the permanent home of “The Dinner Party.” In addition to the display of “The Dinner Party,” the exhibition features more than 100 objects such as rarely seen test plates, research documents, ephemera, notebooks, and preparatory drawings from 1971 through 1979. The exhibition is presented chronologically with not only pieces from “The Dinner Party,” but also works from her study in China-painting, porcelain, and needlework. In addition, there will be research documents and ephemera from Chicago’s studio on display, which highlights the workshop and research project behind the artwork. “The Dinner Party” is the artist’s most influential work and a signature highlight of the Brooklyn Museum’s permanent collection. It was created to rectify the absence of women from the dominant Western historical narrative, while also reestablishing the importance of materials and techniques like ceramics, China-painting, and textiles – traditionally considered the domain of women and domestic labor. Chicago had nearly 400 women and men complete the installation in a vast studio workshop. The artwork is comprised of a triangular table of thirty-nine place settings that each commemorate an important historical or mythical woman. The settings reflect the life of each honored woman and consist of embroidered runners, gold chalices and utensils, and China-painted porcelain plates with motifs based on vulvar and butterfly forms. 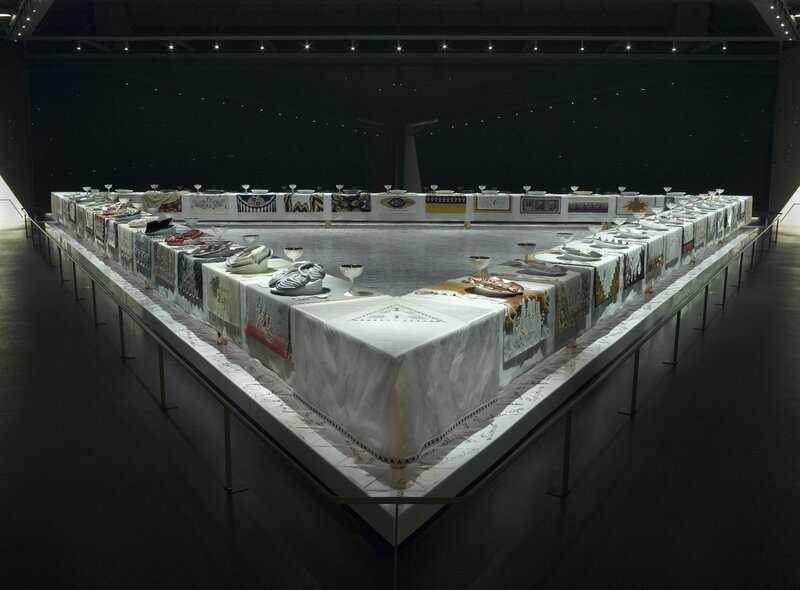 The names of another 999 women are inscribed in gold on the white tiles floor below the triangular table, symbolizing the long history of achievement represented by each place setting. 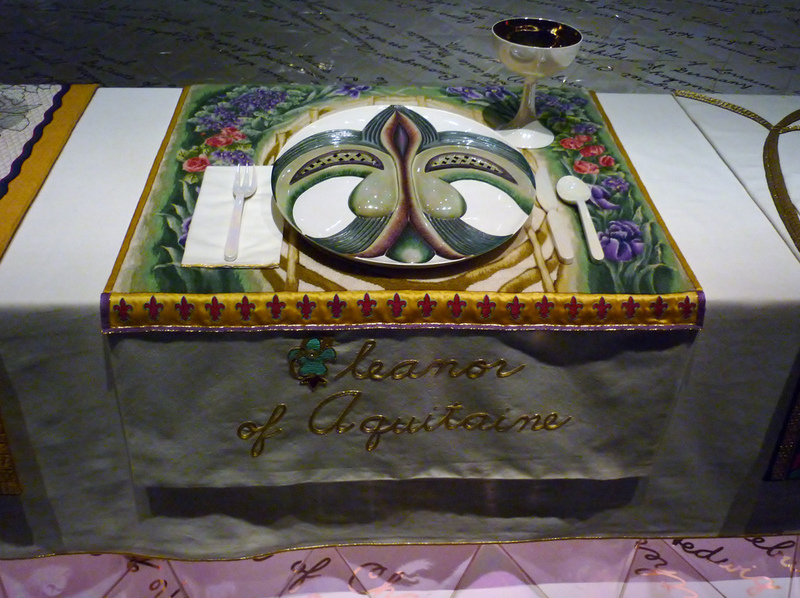 The table is also divided into three wings that each group and represent women of a certain time such as Prehistory to Classical Rome, Christianity to the Reformation, and the American Revolution to the Women’s Revolution. “Roots of ‘The Dinner Party’ : History in the Making” is the final exhibition in “A Year of Yes : Reimagining Feminism at the Brooklyn Museum,” which is a museum-wide series of exhibitions that present voices from the history of feminism and feminist art in celebration of the 10th anniversary of the Elizabeth Sackler Center for Feminist Art.